These policies apply to all our tournaments and events unless otherwise specified in the tournament packet. If you have any questions, the best thing to do is ask us! 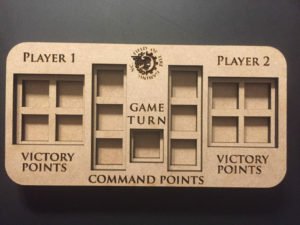 Players are expected to have all current, official rules that may apply to their units available to their opponents and the TO’s. This means either physical codexes, ebooks, or pdfs. We expect players to have FAQ’s that may affect their units however we will strive to have those on hand as TO’s due to the constant release schedule from Games Workshop. Battlescribe or other army building programs are not sufficient as a rules source. We strive to be consistent with the source material and rules of the game. Often we will ask to read the rule and search FAQ’s if an issue or dispute arises. Without access to the source of those rules we reserve the right to not allow a player to use that model or unit. All models should be based on a base that is consistent in size and shape to that of the bases provided CURRENTLY in any Games Workshop box/kit. The only exception to this policy will be Space Marine/Chaos units that released prior to 8th edition. Marine models must be based on either 25mm or 32mm bases but the entire unit must conform to one or the other. Bike/Calvary from these factions may be based on the 75x25mm oval bases (original) or the new 60x35mm or 75x42mm depending on the box. Obviously scenic bases are allowed and encouraged. Proxy models will be allowed to stand in for official Games Workshop models based on TO discretion. If there are any concerns, please do not hesitate to contact us in advance (preferably with pictures). Approval will be based on: same base size; similar dimensions for line of sight purposes; similar war gear/equipment; and finally uniqueness of the model. The “Rule of Cool” is compelling but it must not interfere with game play. Otherwise known as “what you see is what you get”, is the policy that all models should have their respective war gear and equipment represented on the model. All Field of Fire Gaming events will be WYSIWYG up to the TO’s discretion. We recognize it is costly and difficult to purchase enough kits to equipment every model appropriately, however it is imperative to tournament play that it is clear to both players what a model is equipped with. This requirement may be difficult for some very new or very veteran players so we will consider some exceptions. Exceptions will be considered based on, consistency, plausibility, a preference for over-modeling instead of under-modeling, and clear demarcation. Please contact the TO’s before an event if you are concerned you may not meet the WYSIWYG policy. If a proxy/WYSIWYG issue model does not have a TO’s approval and is reasonably unclear, inconsistent with its war gear, modeled for advantage, or does not have the same base size as the model in the list, a TO may decide to remove that model from play and/or determine that it counts as destroyed for all mission purposes. If there is a question concerning a model on the table, please feel free to call over a TO. We can’t see every model at the event and as with many things in this hobby, must rely on players to help us police events. The TO’s will be checking lists prior to the event and at registration. Due to the complexity and numerous sources in 8th Edition, we cannot catch every single error in list building. This is an issue from the smallest events to the largest such as ATC and Adepticon. Please check your opponents list when you arrive at the table. If a list is recognized to be illegal during an event that player will incur point penalties. A list can be illegal for many reasons but commonly due to points, inappropriate war gear/detachment/unit entries, or not actually playing the list submitted to the TO’s. If a list is over in points, the player will lose 50% of their points gained thus far and will be required to remove units/models their list at TO’s discretion for any remaining rounds. A list with inappropriate war gear/detachment/unit entries will suffer the same penalties and lose the offending unit for any remaining rounds. If a player plays a list that is not consistent with the list submitted for that event they will either suffer scoring penalties and conform to the list submitted or be disqualified at the TO’s discretion. We are willing to go back during an event and change an offending player’s win/loss record and score but will only be changing their opponent’s win/loss record and not their score. If a list is found to be illegal after an event has taken place, our only reasonable recourse is to deny that player their Southern Tournament Circuit score and any Field of Fire Gaming related benefits for winning the event. We are unable to recover other lost prize support such as product, store credit, or trophies after a player has left an event. We rely upon our community to bring issues to our attention prior to the end of events. Field of Fire Gaming reserves the right to deny participation in any of our events for repeat offenders. We aim to provide clear instructions on how to score each game in the tournament packet. Sometimes we must follow scoring conventions from other events that we may not love ourselves and can be unusual or confusing. If it is unclear how to score a mission, simply check the packet and if it is still unclear, call over a TO. If for some reason there is a dispute between players over how a mission should be scored, call over a TO. We are happy to walk through the scoring procedure with each table. With this in mind however, we can only arbitrate what we see on the table. This means any prior agreements with opponents, progressive objectives, or other points scored in prior rounds are difficult to track after the fact so please make a note of them somewhere. We can only do so much. If you are able to destroy every enemy model (not counting fliers as per the official FAQ) this is called tabling. We usually allow tabled players to keep the points available to them although they cannot win the game. A player who has tabled their opponent may play out the rest of their turns, rolling to see when the game ends. *Sometimes specific mission packets will override this rule. If we are prepping for a specific event, we will often follow their guidelines. A concession is when a player either refuses to finish a game or is reasonably unable to do so. This includes being late, being asked to leave the event, saying they concede, or refusing to play a game out to its conclusion. A conceding player will earn 0 points for that round. The winner will score as many points as it was possible for them to score from when the opponent conceded. Please call over a TO if a concession occurs. *In the event a player must concede due to late arrival or not being able to play the game at all, we reserve the right pair the remaining player against either a ringer or a player with a bye that round. We recognize that sometimes two opponents do not want to play out the inevitable. If this occurs, either have both players agree to the outcome/score or call over a TO to walk through the final turns. We believe we have an awesome community and do not need to write out a specific set of consequences for sportsmanship violations. All TO’s have agreed, prior to the event on how to handle sportsmanship issues. Every issue is unique and comes down to the TO’s discretion. We do however reserve the right to ask any tournament player or member of our community to leave an event if their presence or actions are disruptive, dangerous, or disrespectful. These will be part of the ‘Best Overall’ award. Your paint score will be added to your battle point score to create the total score. The paint score will be scored by reviewing the level of painting across an entire player’s army. Note that we are not putting any ‘hard’ rules here about painting quality – slapping 3 colors on different parts of models won’t count as ‘basic standard’. A reasonable effort to put colors on the appropriate parts of a model will count. ‘Good tabletop standard’ includes basic shading (washes or dry-brushing done to a reasonable standard would count for this). A model counts as ‘Based’ if the base is painted or sculpted appropriately to represent the ground the model is standing on. Transparent flyer bases automatically count as based. Best Painted award is granted based on review of armies submitted for the Painting competition. Dark Bunny Creatives representatives along with the TOs will determine the “Best Painted” army on multiple levels of technique and execution. All across the Universe, champions have their achievements immortalized in monuments, tales, and even in the very words of their names. At Field of Fire Gaming tournaments, our Champions should expect nothing less. To be crowned “Champion” is to be held as 1st among peers, a mark to be displayed… and challenged by rivals and allies in equal measure. Every Warhammer 40k event will include the naming of such a Champion, with a combination of martial prowess on the table as well as their skills in the hobby itself by bringing fully painted forces to battle (and thus enriching the games for all in attendance). Once crowned, they shall be presented with a Bolt Pistol, emblazoned with the event’s name, along with their own, to proudly display in future events.